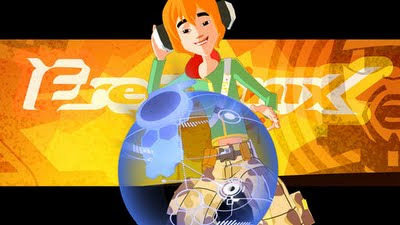 Just seen the episode of Freefonix which I wrote with Rob Venes, PREPSIE IDOL, gets another airing tomorrow on CBBC. Children's animation about a teenage band that discover a magic note, much to the chagrin of the record companies. While Mya tries to figure out a way to sell Fizzy Blast, an overly carbonated ComaCo soft drink, Vox announces he's detected a 13th note prodigy in Los Bosmos. Seeing a way to kill two birds with one stone, Mya holds a viddycast prepsie music contest designed to draw out the prodigy. Freez alone gets picked to perform, while BB and Mo track down Coda, the prodigy. BB empathizes with Coda's desire to win the contest, but she convinces him not to play 13th note. As Coda and Freefonix get away, the Mantis goes after them. A sound clash ensues in which Coda helps our heroes defeat Kurtz, Lady Lux and Hitt.